A major police operation in Linlithgow cornered housebreakers who eventually gave themselves up. 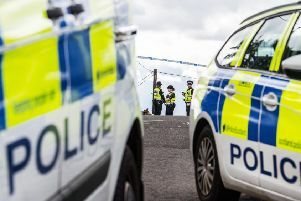 Police Scotland’s various specialist resources and dedicated housebreaking officers arrested three men in connection with multiple housebreakings across the country. The trio, aged 30, 22 and 19, were arrested yesterday (Wednesday, May 27) as part of Operation RAC, Police Scotland’s response to housebreaking in Edinburgh and the Lothians. Officers initially spotted a car in Dunfermline, which was linked to a number of break-ins throughout Edinburgh, the Lothians and Fife and the air support unit was deployed to pursue the vehicle. The car was then followed as it traveled from Fife, through Edinburgh and into West Lothian. Other specialist resources including Road Policing Officers and the Dog Unit were dispatched as part of this response and the men gave themselves up in Linlithgow. All three will appear at Edinburgh Sheriff Court today (Thursday, May 28) for various housebreaking offences, which took place in Edinburgh, Glasgow, Falkirk and Perth. Chief Superintendent Mark Williams said: “Housebreaking continues to be a top priority for Police Scotland and these are significant arrests. “It is an outstanding result for Operation RAC, and illustrates how we can mobilise national resources to tackle local issues.